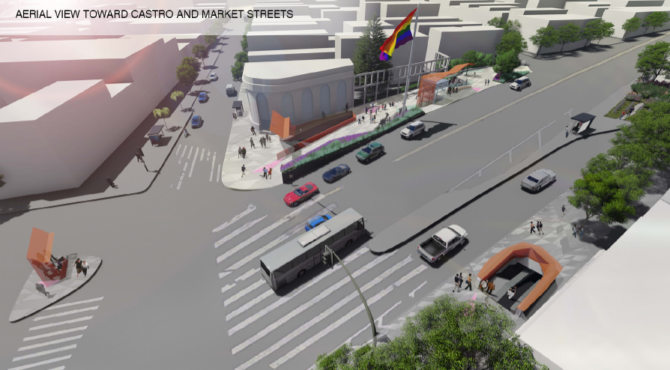 What do you think of the cool new designs for Castro’s Harvey Milk Plaza? 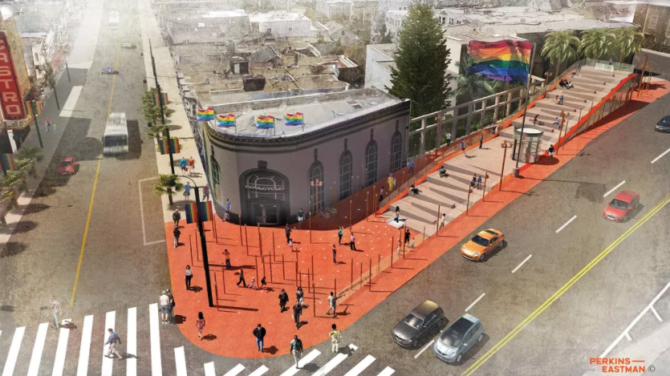 It’s perhaps the word’s most iconic LGBTQ location–but also the most tragic: San Francisco’s Harvey Milk Plaza in the Castro. 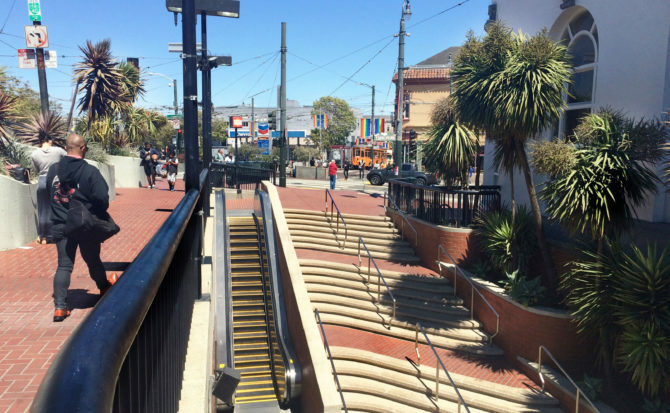 An awkward red-brick, garbage strewn space the size of a school bus, it’s dominated by a long flight of stairs descending below to a subway station and above to a pedestrian passageway along Castro and Market Street, a super-highway disguised as an urban boulevard. Two gas stations flank the intersection with a usually empty Pottery Barn dominating the other. Hardly the kind of urban area befitting a key location of the birth of the modern gay rights movement, a place that still draws tens of thousands of visitors every year for a taste of freedom enjoyed in few other places on earth. The only saving grace is a monster rainbow flag flapping in the wind above the plaza that can been seen from miles away. 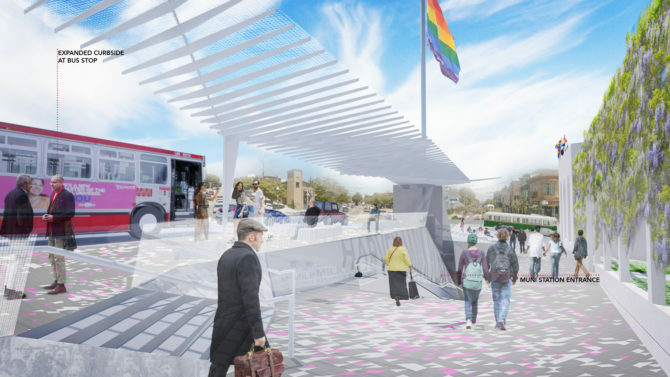 The good news is that thanks to Friends of Harvey Milk Plaza, a non-profit set up to reimagine the public area with a lotta cash still to be raised, it’s on the way to a major makeover. 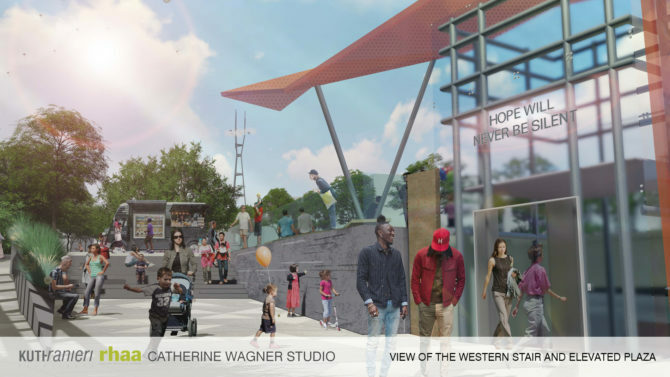 Here are the three finalists from design groups in the competition. Which do you prefer? In my skateboarding days, the amphitheater steps. That intersection cannot shake its thoroughfare feel. It feels tense right there.